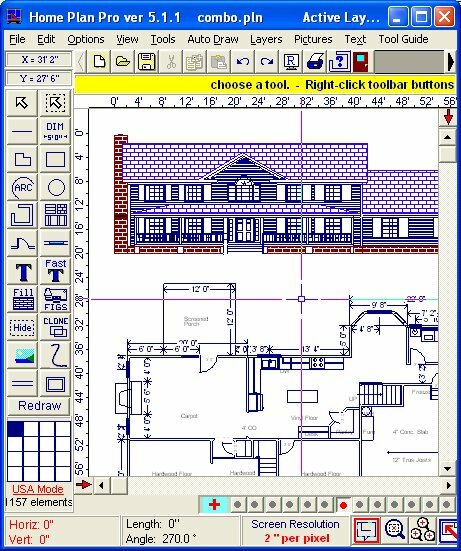 Home Plan Pro Software is for home design. It is so easy to learn how to use, you can begin drawing plans within minutes. Has a steep learning curve. You can begin using Home Plan Pro effectively within minutes. Is hard to use. Easy to use; work progresses swiftly. Is very expensive. Inexpensive, only $39. The integrated on-line help assures quick answers to any questions that arise. You can click a button to download and install program updates so that you always have the latest enhancements at your finger tips. And updates are FREE. You can use the built-in fax driver to fax your plans anywhere in the world. Attach plans to email messages and send them with the built-in email server. Export plans to DXF or bitmap files. Home Plan Pro includes the home design tools you need. Home Design just doesn't get any easier than this. time is devoted to creating great ideas. Copy or clone the last element drawn. Clip and save sections for use later or in other drawings. Multiple Undo/Redo; delete as many elements in a drawing as needed, then restore then one at a time. View and delete individual elements from the drawing. Resize all or part of a drawing. Choose drawing colors, line styles, fill patterns, and so forth. Select from multiple text sizes and attributes. Work with Metric or US Measurement. Calculate distances and areas in feet or meters. Choose conventional or custom print scales. Track cursor movement with the on-screen "Odometers." Draw objects from a few inches to thousands of feet in size. Draw with resolutions down to 1/16" when zoomed in. Use the Activity Log to track time spent on each plan. Save drawings in bitmap (BMP, GIF) or vector format (PLN). Select paper size, orientation, and margins from a graphic display. Print on any paper your Windows printer driver supports. There is, of course, much more to be said here. But hopefully it is clear that Home Plan Pro is comprehensive home design software. Try it and see for yourself. Use it FREE for 30 days. Register it for only $39. We believe you will agree that Home Plan Pro provides far greater power for far fewer dollars than does any other CAD software. It is so easy to learn how to use, you can begin drawing plans within minutes. Since it is easy to use, you save tons of time. On-line help answers your questions in seconds. This is a fully functional version of Home Plan Pro. Install it and try it. See if it is the software you want. You will have thirty days from the day of installation to create plans using Home Plan Pro. You will never be charged a penny unless you specifically ask us to charge your credit card or accept your check or money order. If you decide to do so, you can pay $39.00 to get an unlock code that will entitle you to use it forever. You can remove the program at any time from your hard drive, by using Window's "Add/Remove Programs".